Star Trek is a show with which most people have some familiarity, especially now that the JJ Abrams movies are popular (don’t get me started on that). Star Trek is a permanent entry in the US pop culture lexicon. Most people know at least who Captain Kirk is and who Mr. Spock is, but beyond that, it is left to the fans of the shows to know who is who on the Enterprise, who does what on the ship, and so on. It takes an even bigger fan to be familiar with Star Trek in its further incarnations: The Next Generation, Deep Space Nine, Voyager, etc.Warning: Huge Star Trek fan is about to write about Star Trek. Everyone has to eat, even in the 23rd century. There are a lot of beverages that were favorites of the various crews… Worf’s fondness for prune juice is well-documented. To this day, I still order tea the iconic way Captain Picard did. 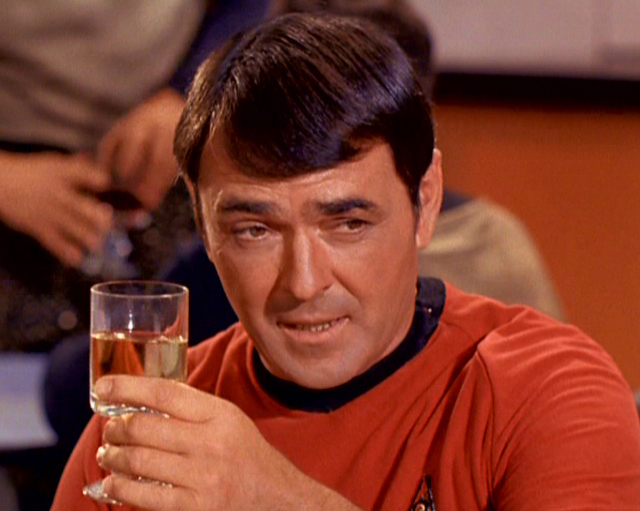 And Mr. Scott (Scotty) enjoyed scotch on many occasions. Three fingers of scotch make you a miracle worker. Yet, aside from the occasional view of the bright blue, nearly glowing Romulan Ale, the still-moving tentacles of Klingon Gakh or some such other slight asides, food wasn’t really a focus for the Original Series or the Next Generation. The feature of food really came into its own in the third incarnation of the series, Deep Space Nine. Set on a space station in a remote area of the galaxy, combined with the setting of a series of shops and restaurants on the station, allowed for the introduction of new customs and culture into the canon. Crew members met for regular lunches, dinners and happy hours. Crewmen had strong Klingon coffee in the morning and ate dinners with their families at night. The commander of the station, Benjamin Sisko, played by Avery Brooks, even had a father who was a famous chef in New Orleans back on Earth. Consequently, much of the food in the Sisko household and on the show is of Cajun-Creole origin. Right away, in the first episode, Sisko is imagining meeting his wife on a beach, offering to make her his father’s recipe for Aubergine Stew. Later in the same season, Jadzia Dax (Terry Farrell) comes into a room where Sisko is waiting to have dinner with his son, and recognizes the stew right away. Since the two have been friends for years, the implication is that he makes it a lot. And it is apparently really enjoyable, best eaten with a giant spoon. Coming back to Earth for a minute, aubergine is a kind of eggplant. It is very popular in Middle Eastern and Persian cuisine, and is best when paired with lamb. That being said, it is important to keep in mind that the Sisko family is from Louisiana, not Tehran. 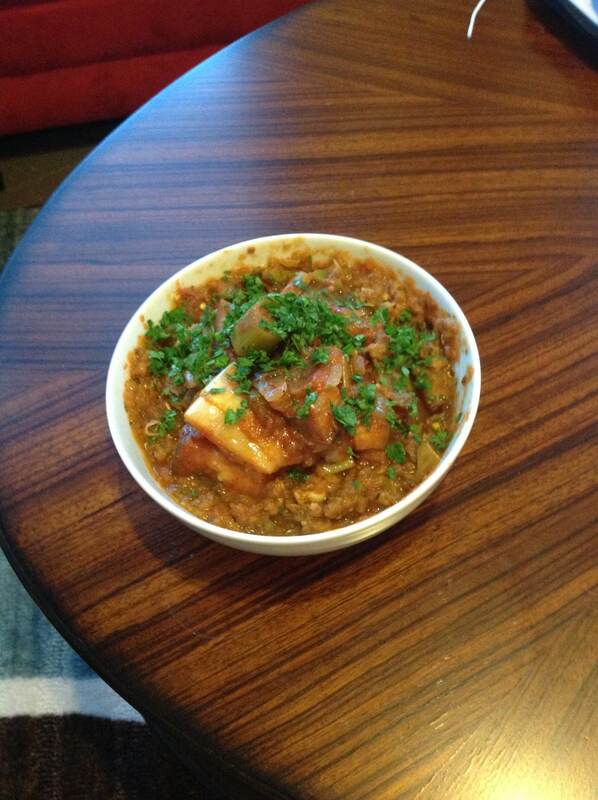 His father’s recipe would likely be a derivative of khoresht-e bademjan, a kind of Persian Eggplant Tomato Stew, but would have significant differences. Khoresht-e bademjan would have spices from the region: Saffron, Turmeric, Advieh. Sisko’s Aubergine Stew would have spices from Louisiana: thyme, cayenne pepper, cumin, black pepper – and would more than likely be made with chicken instead of lamb. It would also include what is well-known in cooking circles as the “holy trinity” of cajun cuisine: bell peppers (I prefer green), onions and celery. An hour or so before you cook, rinse the eggplant and dry. Heat oil in a large, deep pan. Sauté eggplant til golden brown, not burnt. In a large pot or saucepan, heat more olive oil. Cook the onion, garlic and celery until soft, then add the spices and cook for a minute or so until they are fragrant. Add eggplant to the pot then cook for another couple of minutes. Add the rest of the vegetables and cook until they soften slightly. Then add the crushed tomatoes and mix to distribute tomatoes evenly. Add the chicken to the vegetables, cover the chicken in the vegetable mixture then put the lid on the pot and cook on a low heat for about 45 minutes. When you first add the chicken, it will seem too dry to be left on the burner, but don’t worry… the chicken stock is coming. When its all done, he vegetables should be soft and the chicken will be falling off the bone. Remove the chicken from the stew and shred the meat. 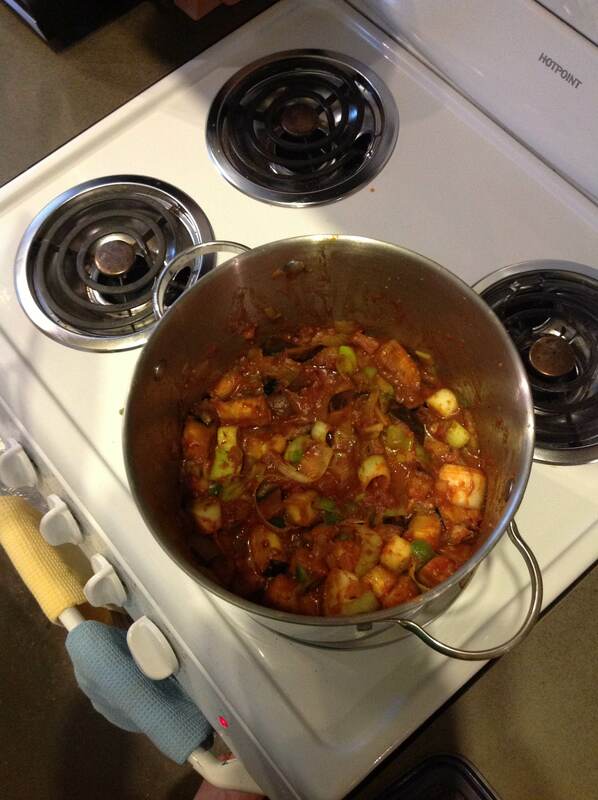 Set aside, along with about a quarter of the stew mixture. Using a food processor or blender, blend the rest of the stew smooth. Put everything back into the main pot and mix well. It is now ready to serve. Garnish with some green, such as chopped parsley. I apparently really love parsley. Khoresht-e bademjan would be served over Persian-style rice. Considering the rice tradition in creole cooking in New Orleans, I think the Aubergine Stew would be nice over rice, but not necessary, as Dax clearly demonstrated with her giant spoon.